Various observers, journalists, intellectuals, critics and authors have discussed various aspects of the life works of multi-dimensional luminary Sri Rao VPS…. Here, Prof. Jasbir Kaur Soin, who has known Sri Rao for the last about three and a half decades, sums up her observations about some of his personal traits from human, spiritual, social and cultural points of views…. Sri Rao has dedicated his life to carry forward the spiritual and cultural legacy of his father …. connected with many academic , cultural and welfare organizations …. besides guiding many a young scholar, he is author of many erudite works …. his illustrious lineage, achievements, accolades showered on him, sit lightly on him …. A true “Karmayogi” ― an urban “rishi”…. like a lotus in the mud, yet pure and beautiful radiating only its fragrance and goodness …. innate nature rooted firmly in the highest traditions of our ancient “adhyatmik” values…. A dutiful son, …. ideal “grihasta”, family man, a truly enlightened wise elder …. house – hold according to the highest traditions of the Indian culture …. passion to propagate the highest traditions and ideals …. complete lack of arrogance, despite the vast knowledge and respect that he commands due to his contributions, illustrious lineage, lofty ideals, self-less work, prolific and inspiring writing and high ethical values …. A true follower and up holder of a true cultural heritage … Always elegantly and appropriately turned out, never ostentatious in dress or life-style…. his efforts can be compared to those of the “Gurus” of early India …. he is a “Gurukul” in himself … As the title of one of his momentous works says, he is a life long Quest for Cultural Conservation and on this path he is embarked on an Onward Journey as torch bearer to guide the populace on the path of true ethical, moral values for the welfare of all …. 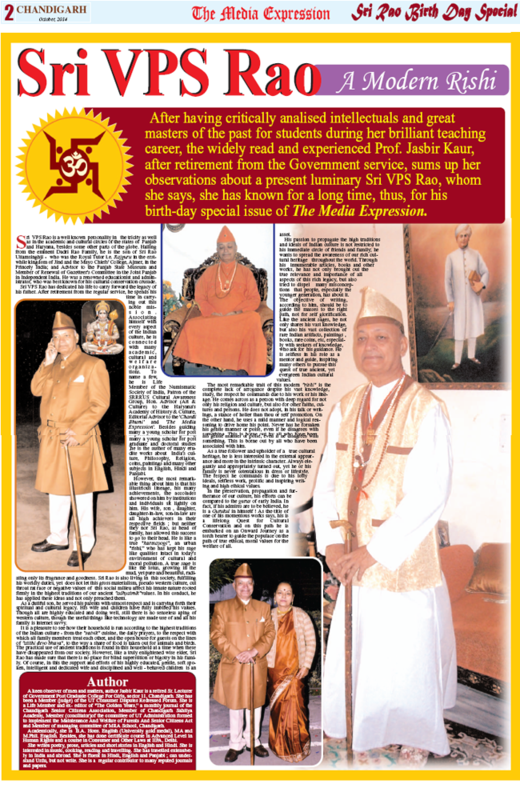 Sri Rao Birth Day Special Issue of The Media Expression ; October, 2014.